The North American edition of the Sustainable Cosmetics Summit will once again be hosted at the Park Central Hotel New York, on 8-10th May 2019. Located in midtown Manhattan, the hotel is within easy walking distance to popular attractions, such as Broadway, Rockefeller Center, and Central Park. 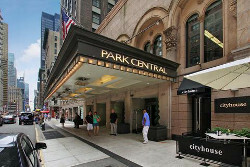 A limited number of rooms are reserved at special rates for Sustainable Cosmetics Summit delegates wishing to stay at Park Central New York. For more details, please contact the organizer.